A reader sent me a video last year of a famous 'biking' move that has remained unchanged for decades. It's still considered "a staple move required to win a contest." If execution is still highly regarded in other competitions, he said, why are our teachers changing "staple" moves and scolding against excellence in technique and execution in our own dance? He had a rather brilliant point. Good technique is just that: good technique. And amazing execution never fails to strike a chord deep within us. We are built to recognize beauty, strength, power, harmony and balance when it looks us directly in the face. It make us speechless. It takes our breath away. Like on Sunday. It must have been fate. I don't watch sports. I usually find out a big game is on because the supermarket is vacant or the freeways are empty. It's pretty sad. But it's the truth. So fate must have made us crave the salad bar at our local pizza joint. We stopped by on our way home, placed our order, and sat down in the back waiting for our order and trading places to make our salads. And then we both froze. Nick mid air, staring at the screen behind me. Me with my fork mid-air, lettuce dangling off, staring at the screen in front of me. 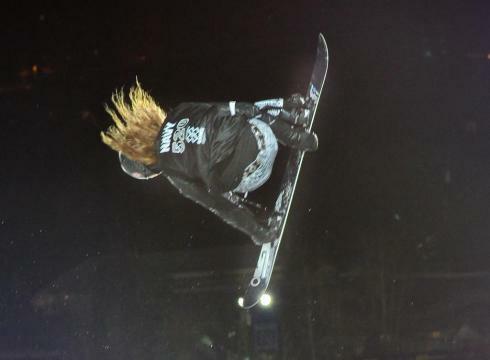 Because whatever the heck Shaun White was doing (snowboarding, right? ), we were in awe the moment he took air. And we both stayed frozen for the rest of the run. And then they replayed it, again and again, and frankly, we really didn't move much. I was in awe at the mathematically perfect angles of his landings, of his perfect pitch, perfect balance, supremely toned timing... I think I could watch it forever. At some point we started saying, "did you see that?" "are you watching this?" "holy cow... what the heck... whoa." And then I thought of my reader, and how right he was. Because technique is technique. And I know damn good technique when I see it. Whatever the sport. I think we all do. I guess we didn't freeze mid-air for nothing. How incredibly lucky are we? And how much does that say, that we, both total non-sports fanatics, completely uneducated in snowboarding, x-games, whatever... how much does it say that perfect technique and execution stopped us in our tracks? Literally? (And may I just say, I feel incredibly blessed to have seen that live.) Our bodies know it when we see it. Excellence rocks. It should NEVER be discounted, shamed or dismissed. Thank you fate. Best salad of my life. And congrats to you, Shaun White!!! You are an inspiration to all of us who value brilliance, hard work and courage. I later heard that you'd already broken a ton of records and could've held back and been safe... but you didn't. You still pressed yourself and gave us your best. We simply can't ask for more!